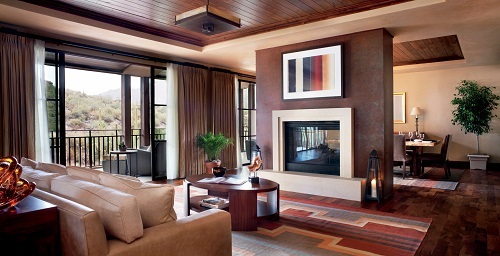 The Residences at The Ritz-Carlton, Dove Mountain is located 25 minutes north of downtown Tucson in Marana, Arizona. The community offers 16 exclusive homesites and 91 customizable residences in Phase I. These available parcels of real estate in Marana can be your one-of-a-kind home, unlike other desert custom homes in the Tucson area. Our Tucson new homes for sale range from 1,668 to 5,460 square-feet with prices beginning in the high $600k’s. The Residences at The Ritz-Carlton, Dove Mountain offers homeowners many luxuries that no other Tucson area residential real estate can. In addition to the beautiful views and custom desert homes The Residences offers homeowners access to the hotel and spa at the resort. The Ritz-Carlton, Dove Mountain has been awarded one of the best resorts in Arizona by Condé Nast, and as a Residences homeowner you can indulge in everything The Ritz-Carlton experience has to offer, from fine dining to a full-service spa. Not to mention the use of the grounds of the grand resort, including the ballrooms and other areas to host weddings or other special events. Residents also have full enjoyment of the beautiful surroundings of The Residences and the resort. Owning a piece of Tucson residential luxury real estate at The Residences not only gives you access to the resort, but also the Tucson community. Many people choose Tucson new luxury homes for sale, since Tucson makes for a great place to find a home and raise a family or retire. Having a large college campus in the heart of the city also lends itself to the community. The University of Arizona offers a place for Tucson area residents to watch the Wildcats play football and basketball, or play golf. Buying Tucson golf real estate would be a wise choice if you enjoy the sport. As a homeowner at The Residences you can play their signature Jack Nicklaus course, and have a front row view of the Accenture Match Play Tournament held at the course each year in February. There is also a multitude of course and clubs to play at in Tucson, making it one of Arizona’s top golf destinations. If you aren’t an outdoor enthusiast, but still admire the beauty of Tucson there is plenty to do. Another thing Tucson is known for is art. Add pieces of unique Southwestern art to your collection or just visit galleries to see various styles of art. In addition to galleries filled with art, you can visit one of the art museums in Tucson. Tucson is home to the Museum of Art, MOCA and the University of Arizona Museum of Art. Buying Tucson residential real estate also gives you the opportunity for fine dining. In addition to the restaurants at the resort that homeowners at The Residences at The Ritz-Carlton, Dove Mountain have access to, there are many new and unique eateries to broaden your palate within the Tucson area. Tucson offers a variety of cuisine, from local favorites to fine dining, there is something for everyone; from wine bars, Mexican food, Sonoran Dog stands, trendy burger spots, to upscale posh places in the city and many of the resorts around town.